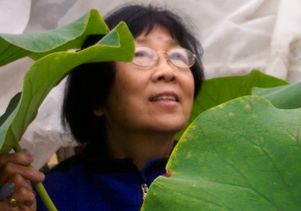 Jane Shen-Miller, a senior scientist with UCLA’s Center for the Study of Evolution and the Origin of Life, has been awarded Charles Reid Barnes life membership in the American Society of Plant Biologists in recognition of her “long record of eminent service” and distinguished contributions to the field. Shen-Miller was a corresponding author on research published in the journal Genome Biology in 2013 by a team of 70 scientists from the United States, China, Australia and Japan, who reported having sequenced and annotated the genome of the “sacred lotus,” which is believed to have a powerful genetic system that repairs genetic defects, and may hold secrets about aging successfully. The scientists sequenced more than 86 percent of the nearly 27,000 genes of the plant, Nelumbo nucifera, which is revered in China and elsewhere as a symbol of spiritual purity and longevity. Shen-Miller said the lotus’s genetic repair mechanisms could be very useful if they could be transferred to humans or to crops — such as rice, corn and wheat — whose seeds have life spans of only a few years. The sacred lotus is known from the geologic record as early as 135 million years ago, when dinosaurs roamed the Earth, Shen-Miller said. It has been grown for at least 4,000 years in China, where every part of the plant has long been used in food and medicine. A recent food science podcast includes an interview with Shen-Miller about this plant. The annual Charles Reid Barnes award, established in 1925 at the society’s first annual meeting, honors Barnes, who was the first professor of plant physiology at the University of Chicago.